If your wardrobe is anything like mine it is easy to lose something – it gets pushed to the back where it doesn’t rub shoulders with the favourites and can easily be forgotten. And then one day you reach for that particular hanger and are met with a pleasant surprise. 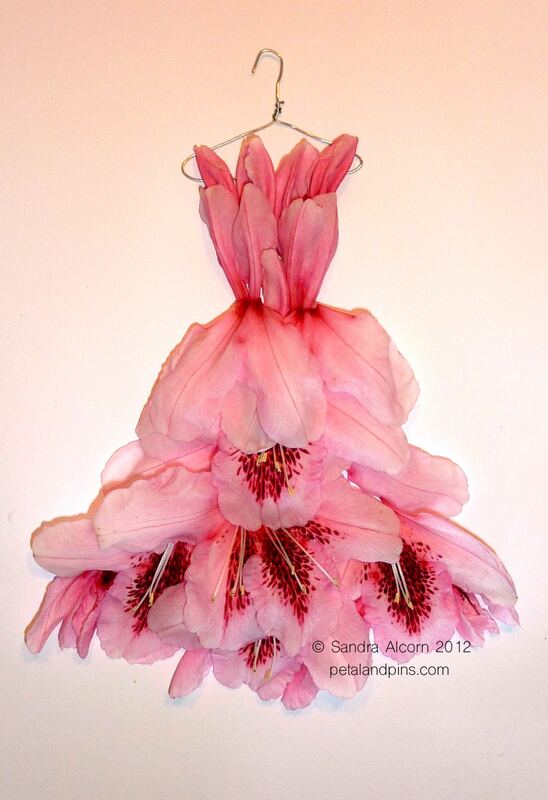 Like this rhododendron dress from my Garden Fairy’s Wardrobe. I created it in October 2012 using flowers from a friend’s garden after a fun day of rhubarb plants, tea cake and gin & tonics. In Rhubarb & Rhododendrons – inspired by that day – you can see another style rhododendron dress which became part of my Spring Gala card collection. Today we are getting together to bottle apples from my garden. I’ll resist serving cake as we are joining another friend later for dinner but a gin & tonic might be a nice reward when all the apples are peeled and done. And I think this dress I’ve unearthed from the back of the wardrobe might just be my new favourite! How delightful – it is a beauty! Wow, what a lovely dress!